SUBHEAD: The military may play a role reducing the toxic influence of neocon and neoliberals within the Deep State. 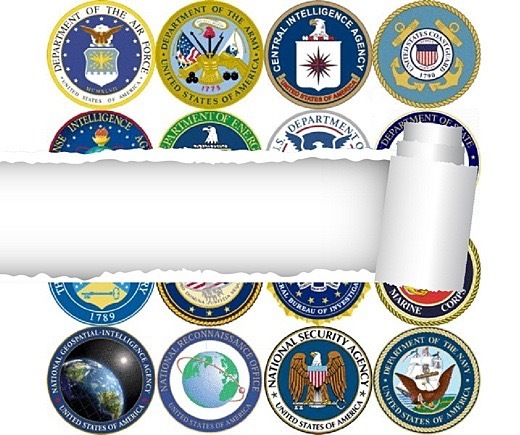 Image above: Mashup by Juan Wilson of split in US intelligence agencies. From (https://www.pinterest.com/explore/central-intelligence-agency/). I have been writing about this structure for ten years and studying it from the outside for forty years. Back in 2007, I called it the Elite Maintaining and Extending Global Dominance, which is a more concise description of the structure than Deep State. Going to War with the Political Elite You Have (May 14, 2007). I've used a simplified network chart to explain the basic structure of the Deep State, which is the complex network of state-funded and/or controlled institutions, agencies, foundations, university research projects, media ties, etc. The key point here is you can't separate these network nodes. You cannot separate The Defense Advanced Research Projects Agency (DARPA), the national labs (nukes, energy, etc. ), the National Science Foundation, Department of Defense, the National Security State (alphabet soup of intelligence/black budget agencies: CIA, NSA, DIA, etc. ), Silicon Valley and the research universities. They are all tied together by funding, information flows, personnel and a thousand other connections. Though we have to be careful not to paint a very large agency with one brush, it's fair to say that the civilian leadership of the CIA (and of its proxies and crony agencies) has long loved to "play army". We can fruitfully revisit the Bay of Pigs disaster, the result of warmongering civilians in the CIA convincing incoming President Kennedy that the planned invasion would free Cuba of Castro's rule in short order. There are many other examples, including the failure to grasp Saddam's willingness to invade Kuwait, given the mixed signals he was receiving from U.S. State Department personnel. "If you want documented evidence of this split in the Deep State--sorry, it doesn't work that way. Nobody in the higher echelons of the Deep State is going to leak anything about the low-intensity war being waged because the one thing everyone agrees on is the Deep State's dirty laundry must be kept private. As a result, the split is visible only by carefully reading between the lines, by examining who is being placed in positions of control in the Trump Administration, and reading the tea leaves of who is "retiring" (i.e. being fired) or quitting, which agencies are suddenly being reorganized, and the appearance of dissenting views in journals that serve as public conduits for Deep State narratives." Many so-called Liberals are alarmed by the number of military officers Trump has appointed. Once you realize it's the neocon civilians who have promoted and led one disastrous military intervention (either with U.S. Armed Forces or proxies managed by the CIA) after another, then you understand Trump's appointments appear to be a decisive break from the civilian warmongers who've run the nation into the ground. If you doubt this analysis, please consider the unprecedentedly politicized (and pathetically childish) comments by outgoing CIA director Brennan against an incoming president. Even if you can't stand Trump, please document another instance in which the CIA director went off on an incoming president-- and this after the CIA spewed a blatant misinformation campaign claiming a hacked Democratic Party email account constituted a successful Russian effort to influence the U.S. election--a surreal absurdity. A number of observers are wondering if the CIA and its Deep State allies and cronies will work out a way to evict Trump from office or perhaps arrange a "lone gunman" or other "accident" to befall him. The roots of such speculations stretch back to Dallas, November 1963, when a "long gunman" with ties to the CIA and various CIA proxies assassinated President Kennedy, an avowed foe of the CIA. If you have wondered why academics like Paul Krugman and the CIA are on the same page, it's because they are simply facets of the same structure. Krugman is a vocal neoliberal, the CIA is vocally neocon: two sides of the same coin. I invite you to study the chart above with an open mind, and ponder the possibility that the Deep State is not monolithic, but deeply divided along the fault lines of Wall-Street-Neocons-Neoliberals and the progressive elements that rightly view the dominant neocon-neoliberals as a threat to U.S. national security, U.S. global interests and world peace.